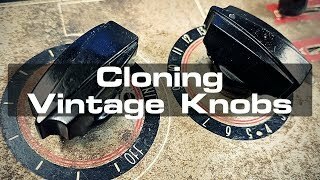 Using black casting resin, I replicated a vintage knob to replace a missing one for a recent gadget purchase. And while I was at it, I made a mold of some other antique knobs for future projects. ▶ Why didn't I degas the silicone? Mold Star is a low-viscosity silicone that doesn't require degassing. I've never had a problem with bubbles when using it. Any bubbles find their way to the top where I have fun popping them, though they generally pop themselves. ▶ Why didn't I just 3D print the knobs? Even if I had a 3D printer, which I don't, I still would have molded the originals because I wanted identical copies (wear and all), not facsimiles with lines in them that I'd have to spend a bunch of time sanding and refinishing. ▶ Why didn't I make a two-part mold? I covered that at 3:54. You must have skipped ahead. Also, it isn't a matter of just flipping the mold and pouring silicone on the other side. You also have to consider the sprues necessary to allow pouring the resin into the resulting mold. And because the knobs are oddly shaped, you may also have to add sprues for venting undercuts so air doesn't get trapped. Then, after demolding, you have to cut off the resulting sprues, file down the flashing and polish them out to get the surface finish back. And, really, there's not much surface area on any of the knobs to accommodate decently sized sprues to begin with. In the end, it's easier just to use a simple, one-sided block mold and drill holes in the bottoms of the knobs. ▶ I actually used the slow-curing version of Smooth-On's Onyx resin in this video, but it doesn't appear to be available on Amazon, so I linked to the fast version above. You can find the slow version at https://www.smooth-on.com/p.... Either will work for this purpose. They just have different working times.